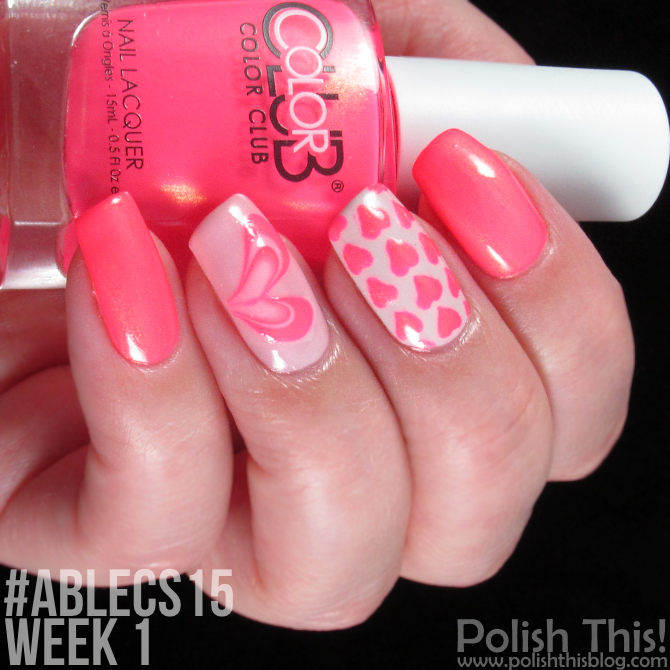 #ablecs15 Week 1: Will You Be My Valentine? - Polish This! Oh my, let me just start by saying that it has been really awesome to see so many of you already joining in our Finnish(able) Nail Art Challenge! This is going to be such an exciting 16 weeks to see all your manicures, so thank you so much all already! And remember, you can always join in the fun a bit later too if you haven't had time to do it already. If you don't know what challenge I'm talking about, take a look at this post. Today I have my second mani of the first week to share with you guys and this one is of course that Valentine's Day themed one. The theme was Will You Be My Valentine? so I really wanted to do something quite traditional and pink for the occasion. However, I didn't want to go with just sweet and delicate soft pinks, so I decided to go with a soft pink AND a in-your-face neon coral-pink together with one of my favorite neutrals. So I used Color Club Peace, Love & Polish for this mani as well as Color Club Bermuda Beaches and Essie Urban Jungle. I did two coats of Peace, Love & Polish on my index and pinky nails and three coats of Bermuda Beaches on my thumb and ring finger nails. For my middle nail I first did two coats of Urban Jungle and then did the hearts with a dotting tool and PL&P. I really wanted to include some water marbled hearts to my Valentine's Day manicure, so I finally added a water marbled heart on my ring finger nail. I did the marbling with the same three polishes and I cut out the heart from the dried water marbled pattern before adding it on my nail. I just recently bought a few Color Club polishes, mainly from the Ticket To Paradise collection and also that PL&P. I can't even remember when I bought any Color Clubs before that since I haven't found them too interesting lately, but somehow the Ticket To Paradise collection caught my eye and I had PL&P on my wishlist for quite a while. Peace, Love & Polish didn't really disappoint me at all, it's just so stunning bright as I thought it would be and I love that golden shimmer in it. It also coveres really well with just two coats! Bermuda Beaches on the other hand wasn't as lovely as I thought it would be. There's really nothing wrong with it, it's a pretty sweet color, but somehow I was hoping for the shimmer to show up more and maybe the polish to be a bit different. I'm hoping I'll like the other ones I bought from the same collection more as I haven't tried them yet. Nonetheless, I quite liked this mani and it certainly screams Valentine's Day as I really wanted it to do. I should have probably practiced those dotting tool hearts a bit before doing them on my nails, since now some of them are quite wonky. But oh well, they looked good from distance... ;) I think the bright neon made this mani a bit more interesting and I love the combo of neutral colors and one bright one. With this mani I also want to wish Happy Valentine's Day to all you lovelies! Hope to see you here soon. Upeat kynnet ja mahtavat värit! Tuo onkin hyvä idea ja tapa tehdä vesimarmorointia. Jos saa udella niin annatko sen kuvion kuivaa vesikipossa ja nostat sen sitten siitä ennen leikkaamista? Kauanko kuivuminen kestää? Mulla on kauhea hinku tehdä vesimarmorointia mutta en haluaisi tökätä jostain syystä sormea veteen vaan kokeilla ensi tällä tekniikalla. Tuo PL&P oli eka Poptastic, jonka ostin ja nyt ne löytyy kaikki. Seuraavaksi ajattelin kotiuttaa Ticket to Paradise kokoelman :). Kiitos vastauksesta :). Mä oon niin kontrollifriikki, etten uskalla tökätä sormea mihinkään tuntemattomaan. Mutta tätä on kyllä pakko testata, kun saa itse päättää mikä kuvio tulee kynnelle! Jospa sitä joskus rohkenisi tökätä sormenkin suoraan kippoon, saas nähdä :).